Music therapy is an evidence-based allied health service similar to physical therapy, occupational therapy, and speech-language pathology that uses music as the therapeutic tool to address physical, cognitive, social, emotional, psychological, spiritual, and/or behavioral needs. Why is Music Therapy So Effective with Parkinson’s Disease? The body and brain naturally respond to music and it is motivating. Therefore, music therapy often results in positive responses when other methods fail. Music is processed in both hemispheres of the brain, where different musical components activate different parts within the brain. When there is damage to the brain, music therapists can “cross reference” and re-access information, or retrain the brain by activating alternate neural pathways and engaging multiple parts of the brain. When a steady beat is involved it recruits motor neurons so that muscles work more effectively and accurately, and clients do not fatigue as fast or experience as much pain so can push harder, are not as sore, and do not need as much recovery time. Singing provides an outstanding way to strengthen the same muscles used for speech and swallowing. 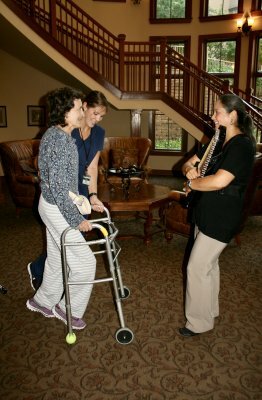 Studies have found that singing in music therapy sessions can decrease or delay problems with swallowing. It can also improve voice volume, clarity, range, and fullness; all of which are often problems for people with Parkinson’s. How Do I Know if Someone is Qualified to Provide Music Therapy Services? Music therapists may carry the designation of NMT, which refers to a specific form of music therapy, Neurologic Music Therapy, that is based on the scientific method, is strongly evidence-based, and requires additional training. NMT Fellow indicates that the music therapist has successfully passed advanced training and peer review of NMT techniques. For the optimal benefit to clients with Parkinson’s disease, they should work with music therapists who work within the NMT model.